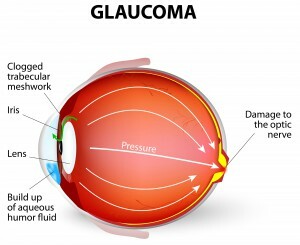 Glaucoma is a disease that damages the optic nerve, the nerve that sends signals from the eye to the brain. Vision loss may be preventable if it is detected and glaucoma treatment is performed early on. However, if left untreated, permanent vision loss can occur. The damage to the optic nerve is usually caused by high intraocular pressure (IOP) due to the drainage area in the eye being blocked or not functioning properly. There are two main types of glaucoma: open-angle and narrow-angle. Open-angle is the most common form of glaucoma—90% of all glaucoma patients in the USA have this type of glaucoma. In most open-angle glaucoma’s, the drainage angle of the eye becomes less efficient and fluid is unable to drain out of the eye causing the eye pressure to rise. Approximately half of Americans with open-angle glaucoma are not even aware that they have it because this type of glaucoma does not have noticeable symptoms until significant vision loss has already occurred. It’s important to get regular eye exams so that open-angle glaucoma can be detected. For this reason, it’s often called the “silent thief of sight”. It slowly causes the loss of your peripheral (side) vision, making you feel like you’re looking through a tunnel. Early detection allows for the disease to be treated and may prevent vision loss. While there is no cure for open-angle glaucoma, early detection and regular follow up care can minimize vision loss. Narrow-angle glaucoma, also called angle-closure glaucoma, is rarer than open-angle glaucoma. In narrow-angle glaucoma, the drainage canal gets blocked and causes a sudden buildup of fluid in the eye, often leading to very high eye pressure. Acute narrow-angle glaucoma is considered a medical eye emergency. If you are experiencing these symptoms, you should call your eye doctor immediately or go to the emergency room. Left untreated, permanent vision loss will occur. Receiving immediate treatment can lower the eye pressure and minimize vision loss.